In 2001, after rejecting a variety of possible local sites and others further afield, the club announced its intention to move 56 miles (90 km) north to Milton Keynes in Buckinghamshire. The idea of Wimbledon leaving south London was deeply unpopular both with the bulk of the club's established fanbase and football supporters generally, but an independent commission appointed by the Football Association granted permission in May 2002. A group of supporters responded by forming a new club, AFC Wimbledon, to which the large majority of Wimbledon fans switched allegiance. Wimbledon F.C. played their first match in Milton Keynes in 2003 and changed their name to Milton Keynes Dons in 2004. In August 2001, the club announced its intent to relocate to Milton Keynes. Despite opposition from the majority of Wimbledon fans, The Football League, and The Football Association, they were given permission to do so on 28 May 2002 after a 2–1 vote by the three-person, independent commission appointed by the F.A. The approval of the decision to move the club caused supporters who were against the move to found a new club, AFC Wimbledon, to which a majority of Wimbledon F.C. fans switched their allegiance. Goalkeeping coach Stuart Murdoch was promoted to manager, and as attendances plummeted, Murdoch's team finished 10th in the league during the club's last full season at Selhurst Park. Wimbledon entered administration in June 2003, and played their first match in Milton Keynes in September. Although crowds attending the club's games at its new base were bigger than those at Wimbledon, the administrator in charge of the club's financial affairs sold any player who could command a transfer fee and Murdoch's team finished at the bottom of the league. The club were brought out of administration at the end of the 2003–04 season, and subsequently renamed "Milton Keynes Dons". The club's nickname was the Dons, though the club were also often referred to in the media as the Wombles from the mid-1970s onwards. Following the FA Cup victory in 1988, the term Crazy Gang also started to be applied; originally to the players, though over time to the club as a whole. The club introduced a character mascot in 2000, a Womble named Wandle the Womble. However, following the relocation of the club in 2003, the owners of the Wombles brand refused to renew the licensing agreement in protest at the move. Three years later, a deal was agreed that saw a similar character named Haydon the Womble appear at AFC Wimbledon. The colours most associated with the club were blue and yellow. The club's first colours were navy blue and white, though the kit changed several times soon after the club's foundation, between combinations of: brown and blue striped shirts with navy blue shorts; green and white striped shirts with navy blue shorts; green shirts and black shorts; white shirts with navy blue shorts, and finally green and black striped shirts with black shorts. Royal blue shirts with navy blue shorts and socks were finally settled upon in 1918, initially bearing a "W" (for Wimbledon) in the centre of the chest. Wimbledon players then regularly wore royal blue shirts with black shorts and socks until a shift in the 1950s saw the shorts change from black to white. A combination of blue shirts, blue shorts and white socks was introduced in 1966, before being abandoned a year later in favour of an all-blue outfit. The white socks returned in 1970. A blue and yellow combination was first used in 1975, but was replaced after a year with an all-white outfit trimmed with blue, and this was the kit in which the club played its first season in the Football League. In 1978, Yellow shirts, blue shorts and yellow socks were adopted, before the club made the change to an all-blue strip with yellow markings in 1981. The kit underwent only minor changes until 1993, when a darker, deep navy blue replaced the royal blue shade that had been used for the previous twelve years. Wimbledon wore these colours for the remainder of their history. As for change colours, a red kit, with black trim, was a frequent choice in the 1990s. The club had a green away kit for the 2000–01 season. The first crest the club wore was the emblem of the Municipal Borough of Wimbledon. This emblem appeared on Wimbledon shirts from the late 1920s until the mid-1950s, when no badge was worn. The coat of arms returned in the early 1970s, before the club adopted its own badge on election to The Football League in 1977. The crest was very similar to the badge most commonly associated with the club – the difference being the inclusion of white rather than yellow. Yellow replaced white in 1981, and this logo was used until 2003. After the club's relocation to Milton Keynes was confirmed in May 2002, the College of Arms informed the club in August 2002 that its continued use of the Borough arms was illegal. 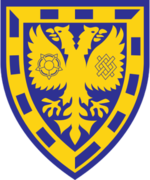 A replacement, given the go-ahead on 12 April 2003, featured a stylised eagle's head – an element from the Wimbledon arms – drawn in navy blue and yellow outline, the yellow forming a rendering of the letters "MK" (for Milton Keynes). Despite being officially adopted in April 2003, the logo's use was inconsistent: the club officially announced that it would be used "on all club kit, merchandise and literature from the start of [the 2003–04] season", including on a new white away kit and on an amended version of the previous season's home outfit, but this did not occur; both the home and away colours from 2002–03 were retained for the following year with the municipal arms still present. Moreover, the old crest continued to appear on official club statements towards the end of the 2003–04 season, making the status of the new badge ambiguous. From 2000 to June 2003, the original Wimbledon F.C. had used a Womble mascot named "Wandle", named after the local River Wandle, as a club mascot. However, in light of the controversy over the moving of the club to Milton Keynes, the licence to use the character was withdrawn by the Wombles' creator, Elisabeth Beresford as a protest. Wimbledon originally played on Wimbledon Common, using the Fox and Grapes public house in Camp Road as the team's headquarters and changing room. The club moved to Plough Lane in September 1912. During the 1930s and 1940s, crowds of between 7,000 and 10,000 were not uncommon at the ground. Wimbledon's highest attendance at the ground came on 2 March 1935, when 18,080 people were attracted to an FA Amateur Cup tie against HMS Victory. Floodlights were first used on 3 October 1960 in a London Charity Cup match against Arsenal. The Plough Lane ground remained comparatively basic, and by the time the club had risen to the First Division the stadium had not changed greatly from Wimbledon's recent non-league days. At the time of the club's acceptance into The Football League in 1977, applicants had only to meet minimal stadium criteria, and once in the League these same criteria sufficed regardless of whether the club subsequently found itself in the Fourth or First Division. However, following the Hillsborough disaster and the subsequent Taylor Report, the football authorities introduced far stricter safety rules, which gave top-flight clubs specific deadlines by which to redevelop terraced grounds or to build new all-seater stadiums. The board of the club decided that Plough Lane could not be made to comply with these new requirements economically and, in 1990, they announced plans to temporarily groundshare with Crystal Palace at their Selhurst Park stadium. Given the location of the Plough Lane ground, at the junction of two major roads and beside the River Wandle, major redevelopment of the site as a modern all-seater stadium might have been difficult, though not impossible. The club's board of directors maintained that it had "searched exhaustively with Merton Council" for a site in or around Merton on which to build a new stadium, looking at "14 different sites over a period of five years", in addition to commissioning feasibility studies for redeveloping both Plough Lane and the neighbouring site at Wimbledon Stadium. Despite this, nothing ever became of the board's continual promises to redevelop the site or to build a new ground within the borough, and the club remained as tenants at Selhurst Park for twelve years. The club had two main supporters organisations– the official Wimbledon F.C. Supporters Club, and the more radical Wimbledon Independent Supporters Association (WISA) which was founded in 1995. The WISA was instrumental in the formation of The Dons Trust in March 2002; this trust, created in part to oppose the relocation to Milton Keynes, helped the WISA to found AFC Wimbledon months after its own establishment. Both the WISA and The Dons Trust from this point became affiliated to AFC Wimbledon, while the official Supporters Club became defunct following the relocation. During much of Wimbledon's amateur and later semi-professional history, a local rivalry existed with neighbouring Tooting & Mitcham United F.C. From the mid 1980s, the club's main rivals were considered to be fellow south London club Crystal Palace (who were their landlord from 1991 to 2003) and west London-based Chelsea; however, neither of these rivalries was seriously reciprocated. Wimbledon were in the same division as Palace for a total of 11 seasons between 1984 and 2004, and in the same division as Chelsea for all but one season between 1986 and 2000. Wimbledon's highest attendance, 30,115, was set on 9 May 1993 for the FA Premier League match against Manchester United at Selhurst Park but their official home attendance record is 18,080 vs HMS Victory in an FA Amateur Cup tie on 9 March 1935 at Plough Lane due to Selhurst Park being borrowed from Crystal Palace FC. For a list of all former Wimbledon players with a Wikipedia article, see Category:Wimbledon F.C. players. Managers from Dowden until Batsford sourced to: Jones, Marc. "AFCW Statistics". FOTO. Archived from the original on 23 April 2009. Retrieved 5 November 2009. Managers after Batsford sourced to: "Manager History for Wimbledon". Soccerbase. Centurycomm. Archived from the original on 3 August 2009. Retrieved 4 June 2009. ^ a b The club's official name on its formation was "Wimbledon Old Central Football Club", but they were commonly called "Wimbledon Old Centrals". ^ The others are Old Carthusians and Royal Engineers. ^ Stuart Murdoch remained manager after the club was renamed Milton Keynes Dons. The date of MK Dons' first league match, 7 August 2004, was agreed upon in 2006 as the dividing line for statistical purposes. ^ a b c "Wimbledon become MK Dons FC". The Guardian. 21 June 2004. Retrieved 4 June 2009. ^ a b c d Heller, Ivor (1 September 2002). "Wombles are on their way". The Guardian. London: Guardian News and Media. Retrieved 4 June 2009. ^ a b c d Pryce, Robert (26 August 2002). "The Dons flow in front of the few". The Guardian. London: Guardian News and Media. Retrieved 4 June 2009. ^ a b c d e f g h i j k l m n o p q r s t u v w x y z aa ab ac ad Rundle, Richard. "Football Club History Database - Wimbledon". Football Club History Database. Retrieved 6 June 2009. ^ Barber, David (18 October 2010). "Four with his head". The Football Association. Retrieved 21 November 2010. “What happened at Wembley in The FA Amateur Cup Final of 1963 between Wimbledon and Sutton that had never happened before and hasn’t happened since?” The answer given at half-time, as I suspected, was “Eddie Reynolds scored four goals for Wimbledon with his head”. ^ Noades, Ron (1 April 2001). "I looked at MK in the 70's". BBC. Retrieved 30 May 2009. I certainly looked for alternatives for rehousing Wimbledon, I mean, I could see the limitations in Plough Lane; but the big problem with Wimbledon was, in my view, was that Richmond Park was several square miles of parkland, where there weren't any houses, and it affected Wimbledon's gates compared to other clubs. Yes, we took an interest in Milton Keynes … we took a controlling interest in Milton Keynes, at the time they had financial problems, and I went up there, I was in the local press, I met the local authority, and they had a stadium site, right next to the big bus terminal there and the station, the main line route from Euston up to Manchester, and they were very keen to get a Football League club, effectively a franchise if you like, into Milton Keynes to take up that site. … I couldn't really see us getting any bigger gates than what Northampton Town were currently getting at that time, and, in fact, are still getting. I really couldn't see any future in it. I can't actually see that there is a means of drawing large attendances to Milton Keynes. ^ Crabtree, Stephen (April 1996). The Dons in the League 1977–1982. Buckingham: Sporting and Leisure Press. ISBN 0-86023-558-0. ^ "QPR offer Clement emotional Loftus Road deal". Daily Mail. Associated Newspapers. 12 September 2007. Retrieved 4 June 2009. ^ "Classic Cup Finals: 1988". The Football Association. Retrieved 24 August 2009. Outsiders at 33-1 before the third-round in January, Wimbledon turned the form book upside down to beat Liverpool, recently crowned League champions and one of the hottest favourites for years[.] … Beasant … was responsible for two FA Cup Final 'firsts' as he became the first goalkeeper to receive the Cup and the first to save a penalty kick at Wembley. … Dennis Wise's right-footer from the free kick curled in towards the near post, Lawrie Sanchez … scored with a simple glancing header into the far corner. ^ "World Notes Britain". Time. 24 April 1989. Retrieved 8 May 2009. ^ "A hard lesson to learn". BBC. 15 April 1999. Retrieved 4 June 2009. ^ "Premier League vetoes the Intertoto Cup". London: The Independent. 17 January 1996. Retrieved 26 January 2010. ^ a b c d e Babbington, Andrea (1 June 2000). "Dons have gone for a Burton". The Independent. London: Independent News & Media. Retrieved 4 June 2009. ^ "Dons swoop for Hartson". BBC Sport. 15 January 1999. Retrieved 7 August 2008. ^ "League warns Dons over move". BBC. 10 August 2008. Retrieved 31 August 2009. ^ a b c "Dons get Milton Keynes green light". BBC. 28 May 2005. Retrieved 31 August 2009. ^ "Report of the Independent Commission on Wimbledon F.C. 's wish to relocate to Milton Keynes" (PDF). The Football Association. Archived from the original (PDF) on 19 November 2004. Retrieved 5 June 2009. ^ White, Jim (11 January 2003). "Pitch battle". The Guardian. London: Guardian News and Media. Retrieved 5 June 2009. ^ a b c "Murdoch takes reins". BBC. 25 June 2002. Retrieved 4 June 2009. ^ Moffitt, Alistair (31 October 2002). "Dons chief shrugs off lowest ever crowd". The Guardian. London: Guardian News and Media. Retrieved 4 June 2009. ^ "Wimbledon go into administration". The Daily Telegraph. London: Telegraph Media Group. 6 June 2003. Retrieved 5 June 2009. ^ a b Pryce, Robert (29 September 2003). "Wimbledon's happy ending is pure Hollywood". The Guardian. London: Guardian News and Media. Retrieved 4 June 2009. ^ Milledge, Adrian (7 April 2004). "Wimbledon fall through trap-door". The Guardian. London: Guardian News and Media. Retrieved 4 June 2009. ^ a b "Wimbledon to change name". BBC. 21 June 2004. Retrieved 5 June 2009. ^ a b c d e f g h i j k l m n o p q r s t u Moor, Dave. "Historical Kits Wimbledon". Historical Kits. Retrieved 3 June 2009. ^ Stockford, Tara. "Wombles football mascots". Tidy Bag - The Online Wombles Museum. Retrieved 3 June 2009. ^ a b c "New Wimbledon Football Club Logo". Wimbledon F.C. (transferred to mkdons.com). 15 April 2003. Archived from the original on 1 April 2012. Retrieved 7 September 2011. ^ "New Second Strip". Wimbledon F.C. (transferred to mkdons.com). 29 May 2003. Archived from the original on 1 April 2012. Retrieved 8 September 2011. ^ "Club Statement". Wimbledon F.C. (transferred to mkdons.com). 27 May 2004. Archived from the original on 1 April 2012. Retrieved 8 September 2011. ^ "Official Statement". Wimbledon F.C. (transferred to mkdons.com). 21 June 2004. Archived from the original on 1 April 2012. Retrieved 8 September 2011. ^ Plummer, David (13 May 2003). "Even the Wombles refuse to follow Wimbledon to Milton Keynes". The Guardian. London. Retrieved 14 August 2011. ^ "Financing a New Stadium". Wimbledon F.C. 2003. Archived from the original on 23 February 2008. Retrieved 5 June 2009. ^ a b c "Milton Keynes Dons/AFC Wimbledon". European Football Statistics. Archived from the original on 27 February 2009. Retrieved 4 June 2009. ^ a b c d "WISA - A Brief History". Wimbledon Independent Supporters Association. Archived from the original on 24 December 2012. Retrieved 23 August 2009. ^ a b c "About the Trust". AFC Wimbledon. Archived from the original on 25 September 2009. Retrieved 23 August 2009. ^ "Rivalry uncovered" (PDF). Football Fans Census. December 2003. Archived from the original (PDF) on 10 September 2008. Retrieved 3 June 2009. ^ a b Jones, Marc. "Roy Law". FOTO. Archived from the original on 23 July 2011. Retrieved 8 October 2009. ^ Jones, Marc. "Eddie Reynolds". FOTO. Archived from the original on 23 July 2011. Retrieved 8 October 2009. ^ a b Jones, Marc. "Ian Cooke". FOTO. Archived from the original on 23 July 2011. Retrieved 8 October 2009. ^ a b "Alan Cork". Sporting Heroes. Retrieved 4 June 2009. ^ a b c d e f "MK Dons (formerly Wimbledon) all time records". Soccerbase. Centurycomm. Archived from the original on 3 August 2009. Retrieved 4 June 2009. ^ "Hartson joins Wimbledon for £7.5m". The Guardian. London: Guardian News and Media. 15 January 1999. Retrieved 4 June 2009. ^ Nixon, Alan (6 July 2000). "Newcastle beat Tottenham to sign £7m Cort". The Independent. Merton, Greater London: Independent News & Media. Retrieved 4 June 2009. ^ a b c d "Wimbledon : Records". Statto. Archived from the original on 16 January 2011. Retrieved 4 June 2009. ^ Shaw, Phil (26 June 1995). "No picnic for English clubs by the sea". The Independent. London: Independent News and Media. Retrieved 26 January 2010. ^ "Wimbledon Official Site". Wimbledon F.C. 5 April 2004. Archived from the original on 12 April 2004. Retrieved 25 August 2009. ^ a b Hambly, Dave. "1930 to 1939". Historical Dons. Archived from the original on 21 September 2008. Retrieved 4 June 2009. ^ a b c Hambly, Dave. "1940 to 1949". Historical Dons. Archived from the original on 24 September 2008. Retrieved 4 June 2009. ^ a b c d Hambly, Dave. "1950 to 1959". Historical Dons. Archived from the original on 21 September 2008. Retrieved 4 June 2009. ^ Hambly, Dave. "1960 to 1969". Historical Dons. Archived from the original on 11 March 2008. Retrieved 4 June 2009. ^ a b c d e f g h Hambly, Dave. "1970 to 1979". Historical Dons. Archived from the original on 19 February 2012. Retrieved 4 June 2009. ^ a b Hambly, Dave. "1980 to 1989". Historical Dons. Archived from the original on 30 September 2011. Retrieved 4 June 2009. ^ "Manager History for Wimbledon". Soccerbase. Centurycomm. Archived from the original on 3 August 2009. Retrieved 4 June 2009. This page was last edited on 23 April 2019, at 14:50 (UTC).